A free community event held at ‘The Centre @ Elsea Park’, Sat 20th April from 10:30am till 12:30pm. Drop in for some Easter fun, refreshments, a free Easter egg, enjoy some crafts, listen to live music and hear about Easter. Over the past few years we have been visiting Elsea Park houses with invitations to our Easter events and giving away Cadbury Creme Eggs. 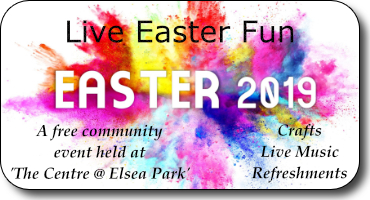 This year we wanted to do something a little different so, we are hosting a community event at “The Centre” @ Elsea Park where we woul like to invite you to join us for some Easter fun and receive a free Easter egg. Easter is a time to remember with joy, an event in history when a man sacrificed himself for us and on the third day rose from the grave as he had already promised. This man is Jesus. Come and hear more.